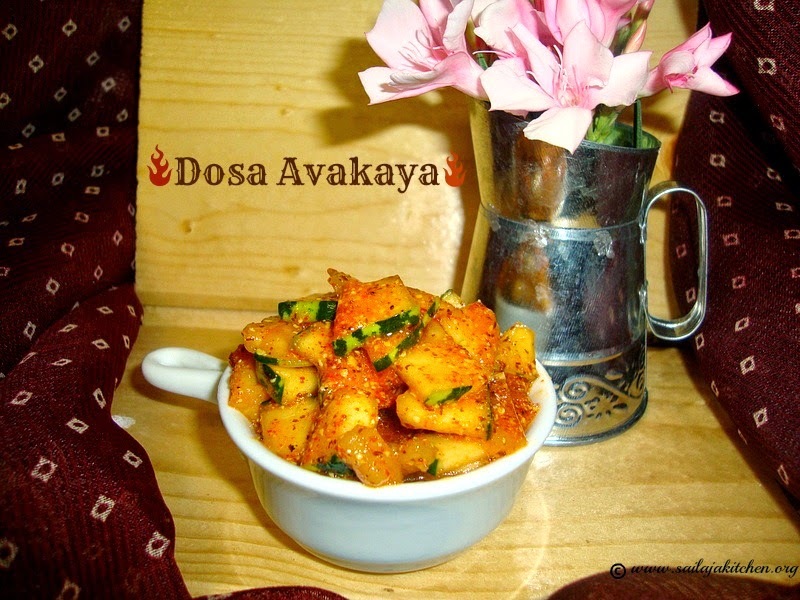 Take a clean bowl add all above mentioned ingredients & the dry roasted powder and mix. Heat oil in a pan & temper it,cool the tempering, pour it into the bowl. Mix well till everything is well combined,cover it with a lid and keep it outside overnight. Next day mix once and put it in a dry jar and store it in fridge. 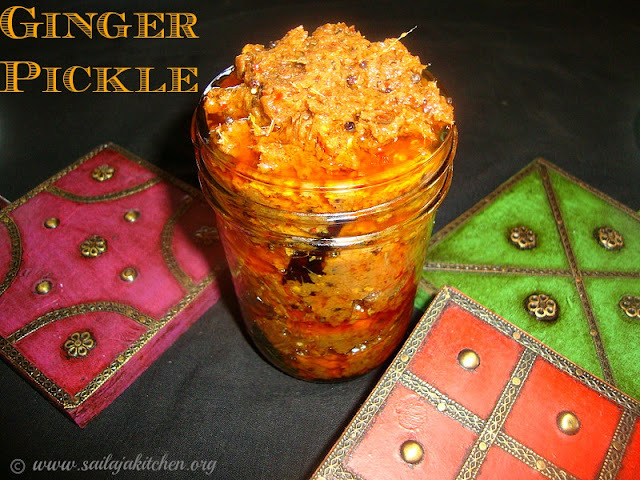 Your crunchy cauliflower & carrot pickle is ready to serve. a) Dry roasting methi and mustard seeds are optional. b) Keep this pickle in refrigerator. Blend all the above ingredients under grind to a fine smooth paste. Do not add water while grinding.Sprinkle very little if needed. Immediately pour the ground paste into the hot tempering,give a quick mix. Switch off the stove,Leave the mixture to cool completely.Cover & keep it for a day out. Next day mix it well again & store it in a clean jar. 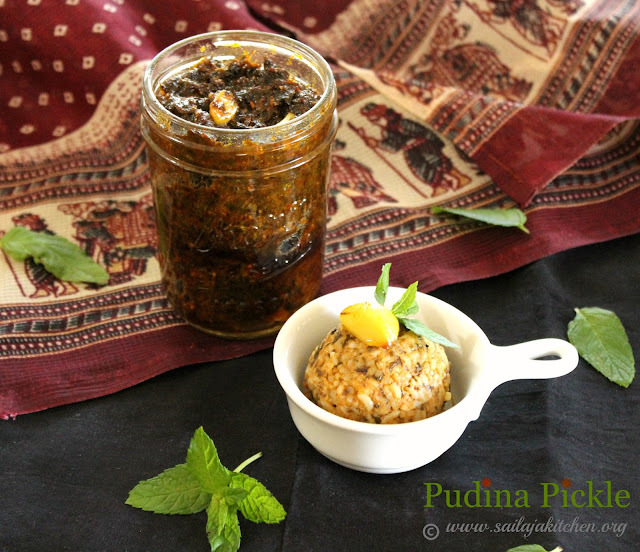 Keep it in the fridge.Serve with dosa,Idly or even with rice. Take a clean jar add all the ingredients and mix them evenly. Cover and leave it for a day,next day gently shake the bottle for even mixing. 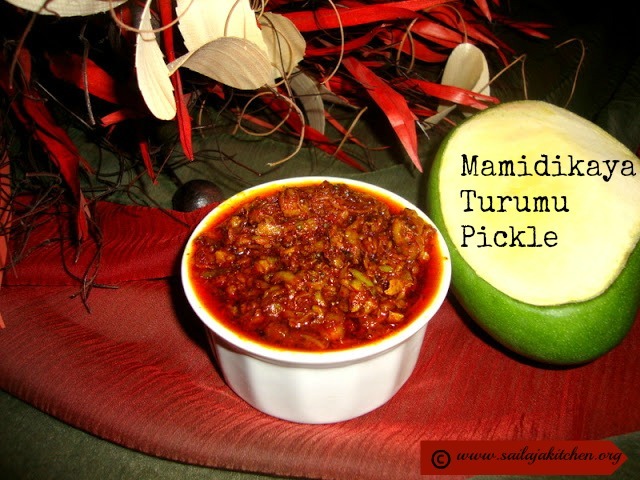 Repeat it for 3 to 4 days till its slightly mushy,your pickle is ready to serve. Remove the leaves from the stem,wash and spread them on a clean cloth till its dry. Make sure there is no water.Do not dry them in sun. 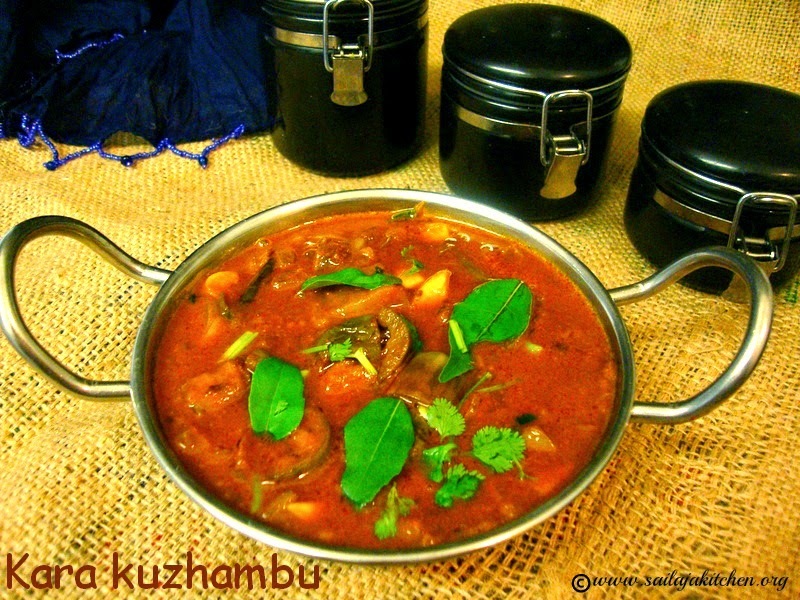 Heat oil in a pan add the red chillies,tamarind if using & the leaves,in medium low flame fry till the leaves are soft. Cool this mixture & grind it to a semi coarse paste.Do not add water while grinding. Remove it in a bowl and keep it aside. Now heat oil in a pan add the tempering ingredients,lastly add the garlic. Fry till its light brown,switch off the stove & pour the hot tempering into the ground gongura. 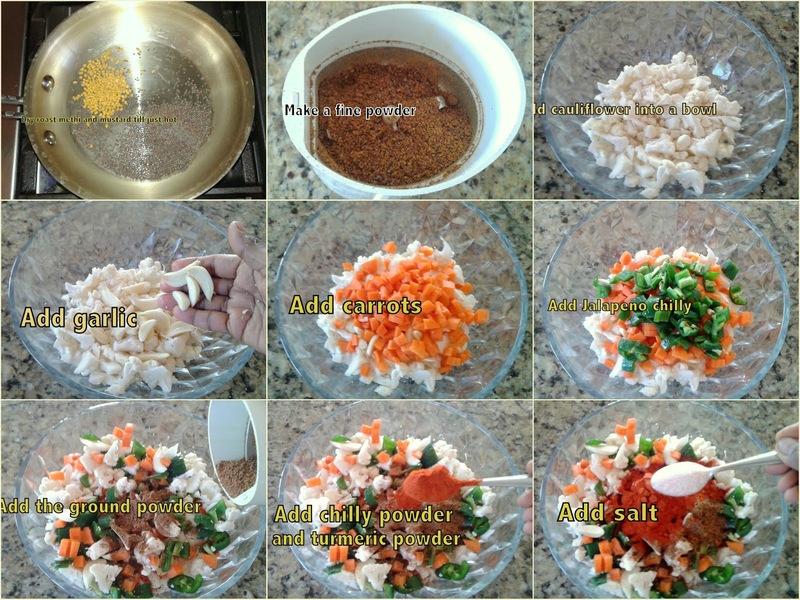 Mix it well & serve it with hot rice. a) Dry the leaves inside the house.Do not use the stems just the leaves. b) Just before serving add chopped onions for extra taste. c) As i have used very little oil i am going to store it in fridge. 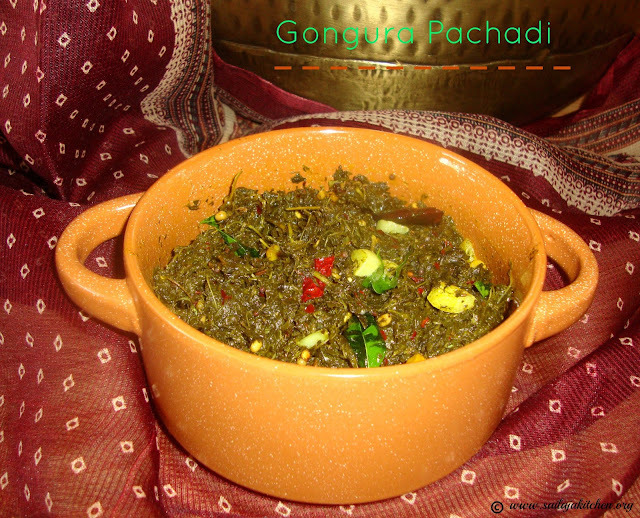 d) My gongura was not sour so i added tamarind,if leaves our sour then don't add. Take a blender add the mint ,tamarind,chilly powder,turmeric powder & salt.Grind it to a coarse paste.Do not add any water while grinding. Heat oil in a pan add the garlic and fry till its slightly soft,now add the ground mixture & saute till oil floats on top.Switch off the stove mix the ground powder. Cool completely and store it in a clean jar in fridge. Mix all above ingredients together in a bowl. Spread it on a plate & keep it in sun for 2 to 3 days or till all the water has evaporated. Do not dry it till too crisp. Heat oil in a pan temper it with mustard seeds,switch off the stove when it starts to splutter. Add the hing & fenugreek powder. 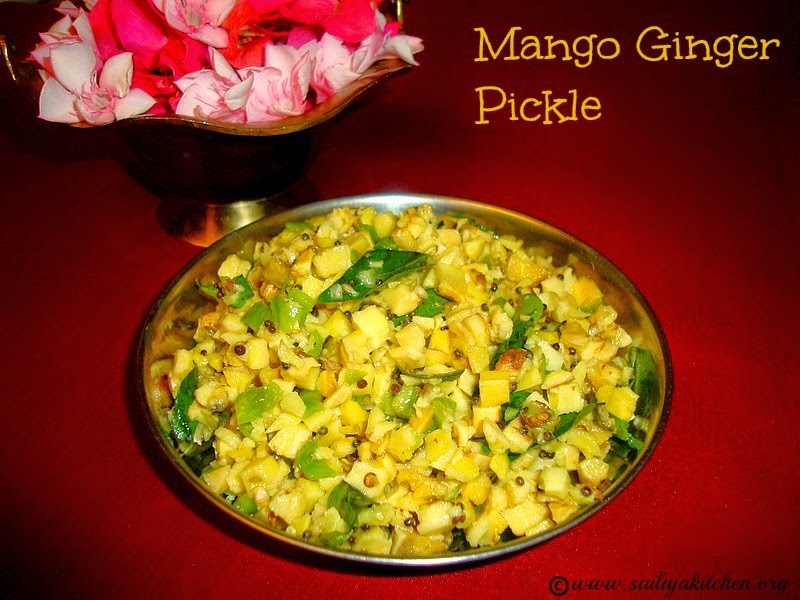 When still warm add the chilly powder & the sun dried grated mango,mix it well. Cool the mixture completely & store it in a clean bottle. Best served with curd rice. a)If you want to keep it outside then make sure there is no water in the mangoes. b)Store it in a very clean sterilized jar. 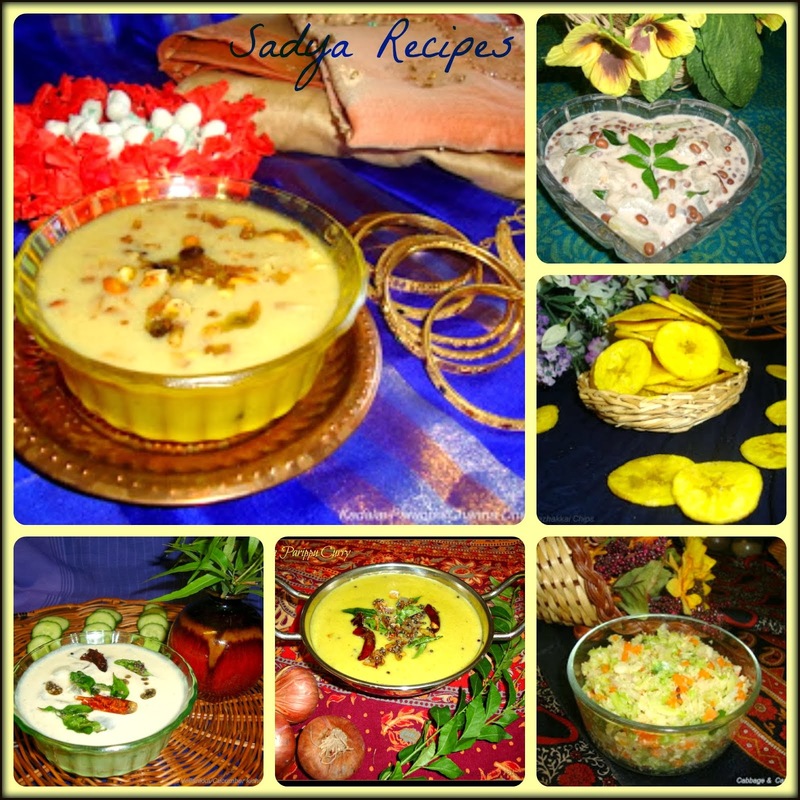 c)Cool the oil when still warm mix the chilly powder & mangoes.Do not add it when hot. Dry roast above ingredients slightly.Cool & powder them to a semi coarse powder.Keep it aside. Take a sauce pan add salt,turmeric powder,gooseberry & water. Boil this for 2 minutes & switch off the flame. Today i have used frozen gooseberry so did not boil too much.When using fresh gooseberry boil it till its half cooked.For this recipe fresh gooseberry is better. Now heat oil in a pan temper it with above mentioned ingredients. Mix the tempering and the ground powder into the gooseberry liquid. Mix well,cool and store it in a clean glass jar. Heat oil in a pan,add the chopped garlic. In medium high flame fry the garlic till it turns brown & crisp. Do not over fry & burn the garlic. Switch off the flame ,while still hot add chilly,coriander,turmeric powder & salt. Mix well & store it in a clean glass bottle. Remove the skin of the mango ginger,wash them & pat dry. Chop the mango ginger to small pieces. Take a wide bowl add the chopped mango ginger,green chillies,salt & lemon juice,mix it well. Heat oil in a pan & temper it with above ingredients.Pour it into the bowl. Mix everything well,keep it in fridge & serve after a day. a) Fresh green peppers can be added instead of green chillies. c) Adjust lime juice according to your sourness. 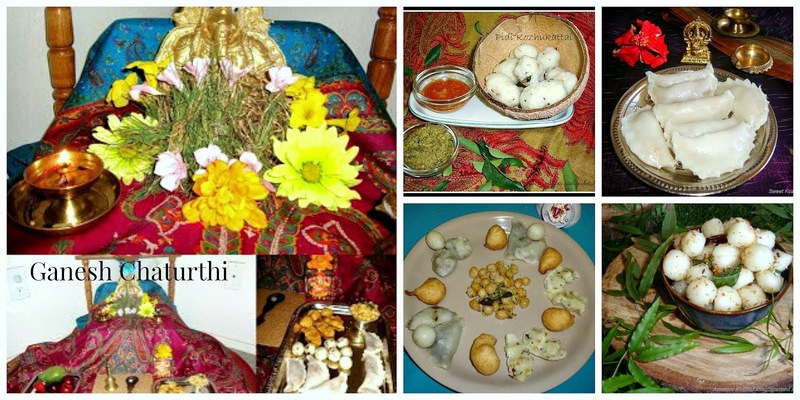 d) Red chilly powder,dry roasted & powdered methi seeds can be added. Dry grind mustard & methi to a coarse powder,keep it aside.Do not dry roast. Soak tamarind in warm water for 10 minutes & extract the pulp from the tamarind. Cook the pulp till it reduces & you get a thick paste. Now take a wide bowl mix the chilly powder,salt & mustard methi powder.Add the fried drumstick & gently mix them .Do not break the pieces. Add the cooled tamarind paste & the cooled tempering. Cover it with a lid & leave at room temperature for 24 hours. Next day mix gently,cover & keep it for one more day. 3rd day mix & store it in a clean glass jar. 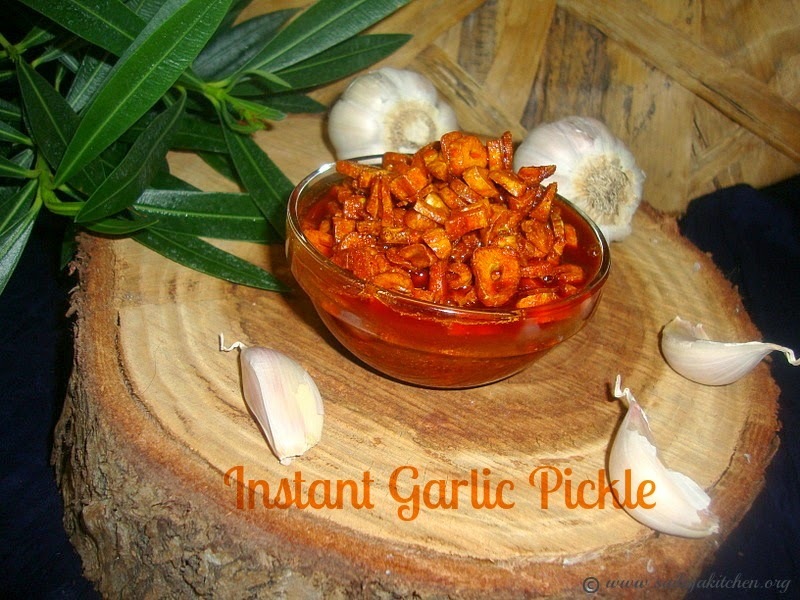 No need to add any preservatives.Try to keep a layer of oil on top of the pickle always. I usually keep all the pickles in fridge. 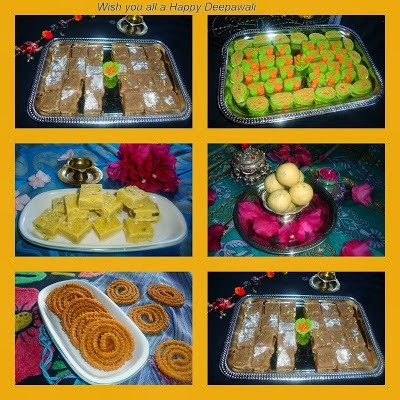 Enjoy it with hot rice! If you are going to keep the pickle outside then make sure there is no water at all in the pickle.Otherwise your pickle will go bad. If making in small quantity i prefer to keep it in fridge. For extra flavour garlic can be added. 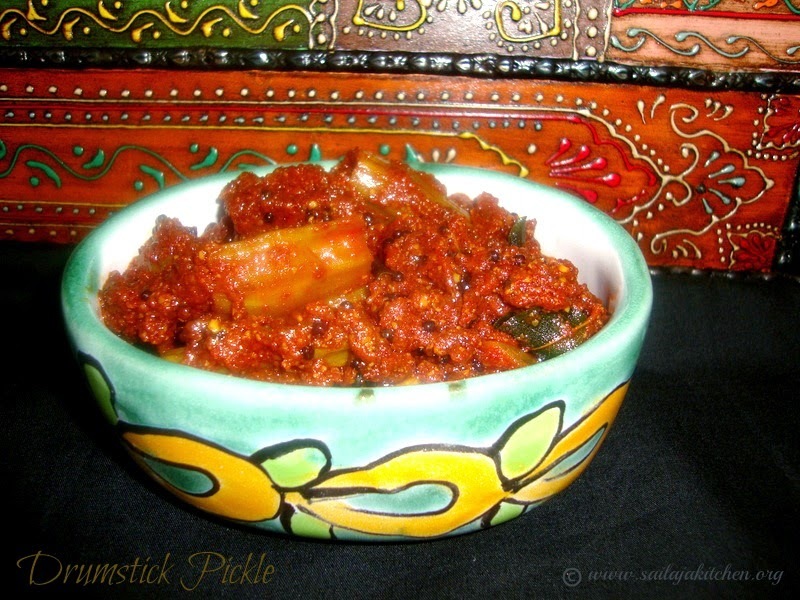 Step by step method/picture for making Andhra style Avakai/Avakkai (Mango Pickle). Mix the garlic ,methi & all dry powders in a plate. Pour oil in a bowl,add the mangoes mix it well. Add the powder mixture & mix it,make sure all the mango pieces are coated well. Cover & keep it at room temperature for 3 days. 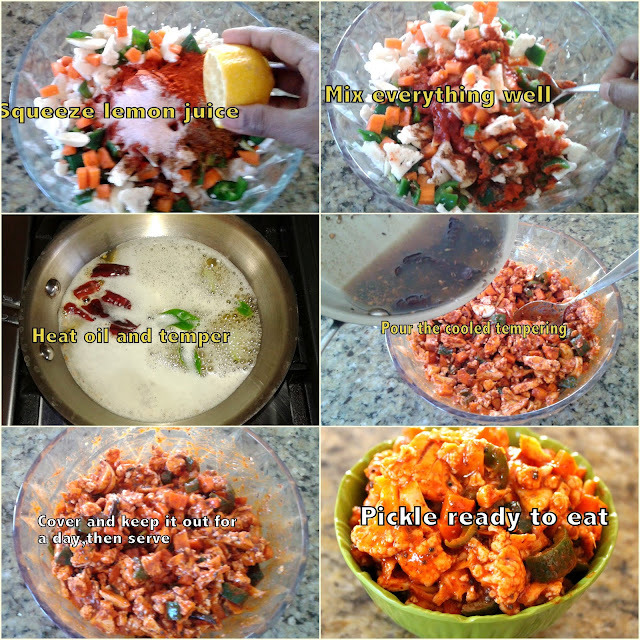 The pickle is ready to eat on the 4th day,mix it well & store it in a clean bottle. a)Make sure there is no water content in the pickle,otherwise your pickle will go bad. b)On the 3rd day oil should float on top of the pickle,if its less feel free to add more oil. 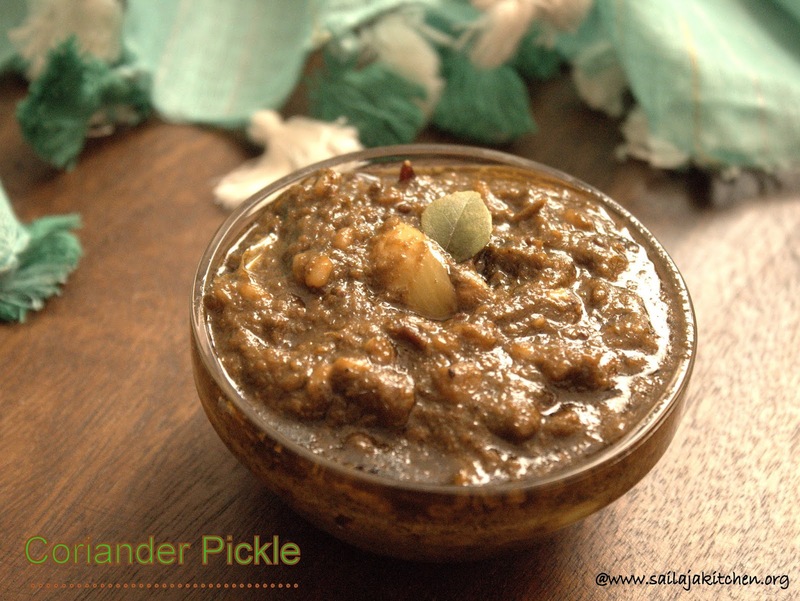 c)Use sesame oil for making pickles, this gives the best taste to your pickle. d)You can alter the taste on the 4th day if salt or chilly powder need to be added more. g)Each time you take pickle use only dry spoon. Take a bowl add salt,methi powder ,red chilly powder & chopped mangoes,mix it well. Heat oil in a pan temper it with above ingredients,switch off the stove. Cool the tempering,pour it into the mango mixture. 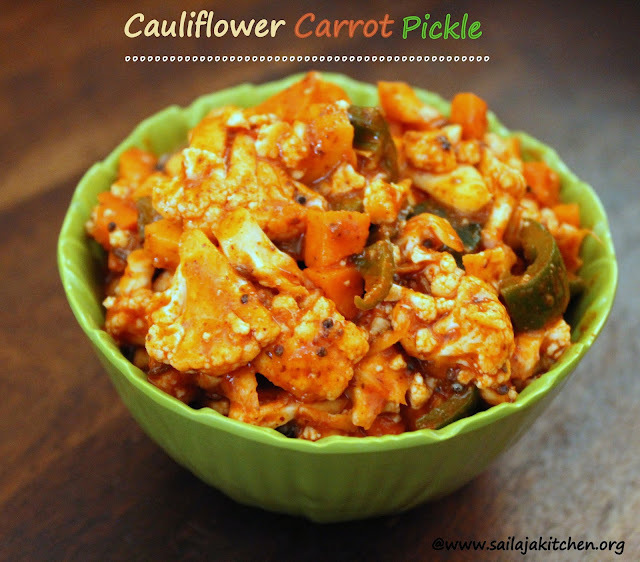 Mix well & best serve with curd rice. 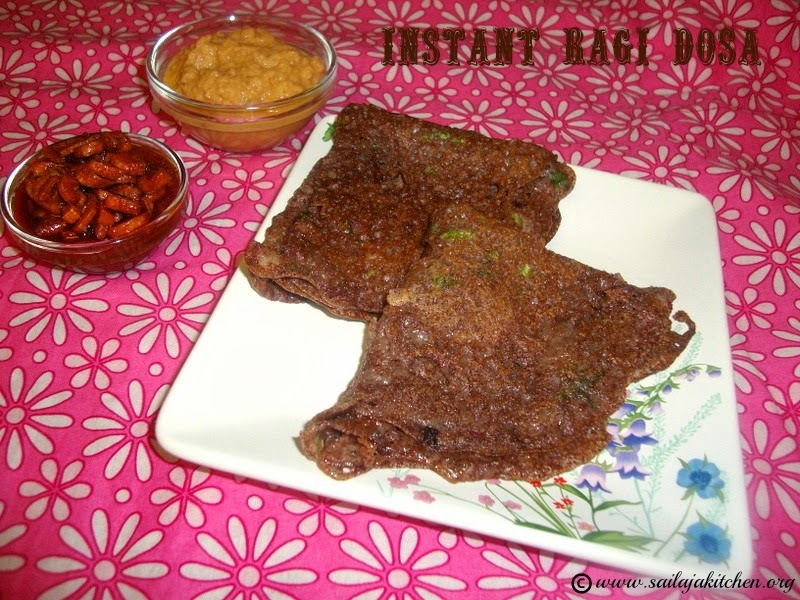 Chop dosakaya with skin to small pieces.Place it on a cloth or kitchen tissue for 10 minutes to remove excess water. 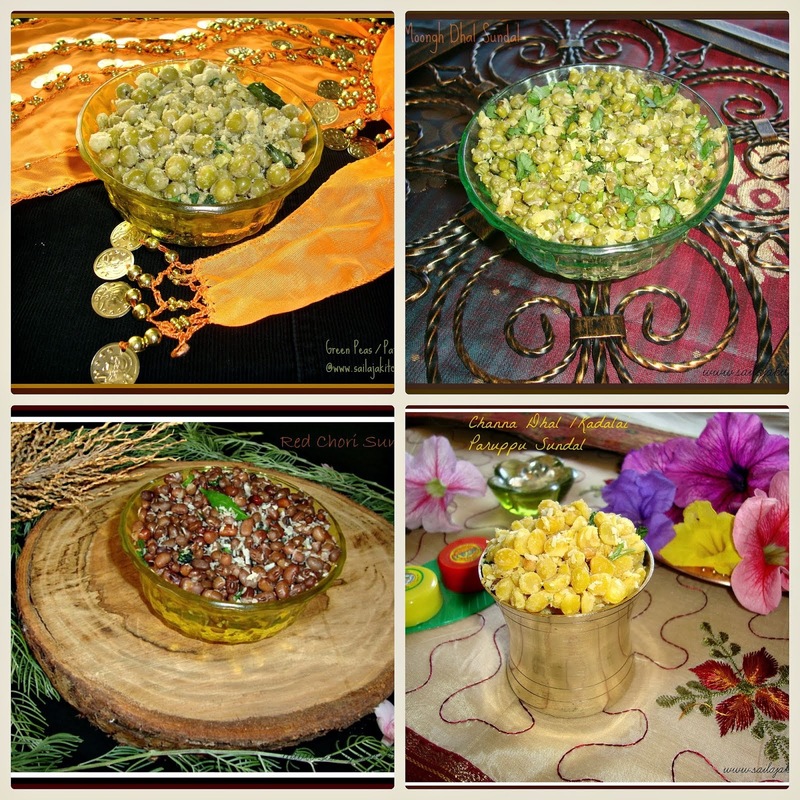 Powder mustard & fenugreek to a fine powder.Do not dry roast methi & mustard. Take a large bowl add the chopped dosakaya,mustard methi powder,salt,red chilly powder,hing,lime juice & oil. Toss them well to make sure all the pieces are coated with the masala. Cover with a lid & keep it overnight.Next day mix the pickle well. b) Add chilly powder & salt according to your taste. c) Store it in fridge,will stay good for 3 to 4 days. 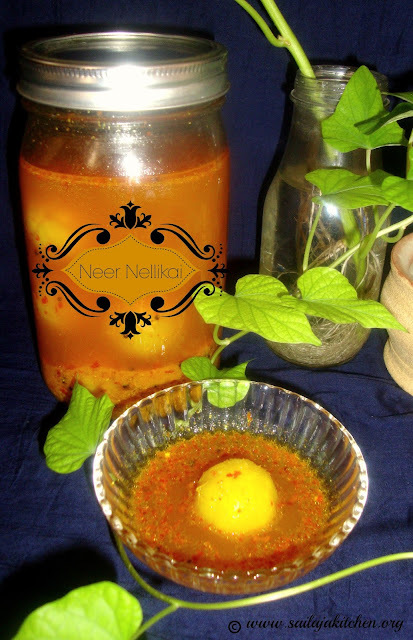 Take a clean dry jar add the cut lemons,salt & turmeric powder.Mix it well & leave it covered for 3 days. Each day just mix it well with a clean spoon. The 3rd day mix the chilly powder to the soaked lemon. Heat oil in a pan & temper it with mustard,hing & methi seeds. Cool the tempering & pour it into the pickle.Mix it well & best served with curd rice. 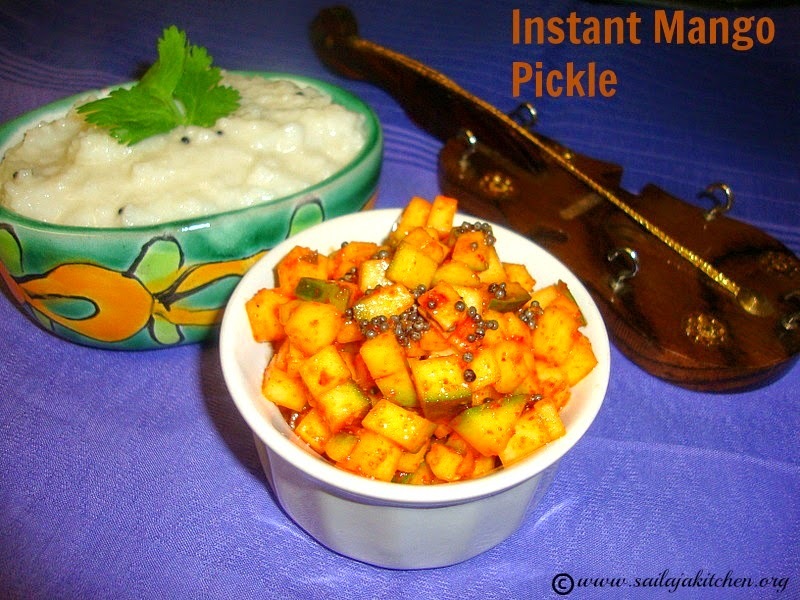 Always use dry spoon to take pickles. This pickle should be stored in fridge. Cook the tamarind juice till semi thick paste. Take a mixi jar or blender add the cooled tamarind paste or soaked tamarind,salt, chilly powder & coriander leaves without any water grind to a smooth paste.Add very little water if needed. Heat oil in a pan and temper it with above ingredients,once the garlic is slightly brown pour the ground paste into the oil. Mix it well and cook till its thick.Lastly add the jaggery and mix. Cool and store it in a clean jar in fridge. Best served with tiffins or mixed with rice and eaten. 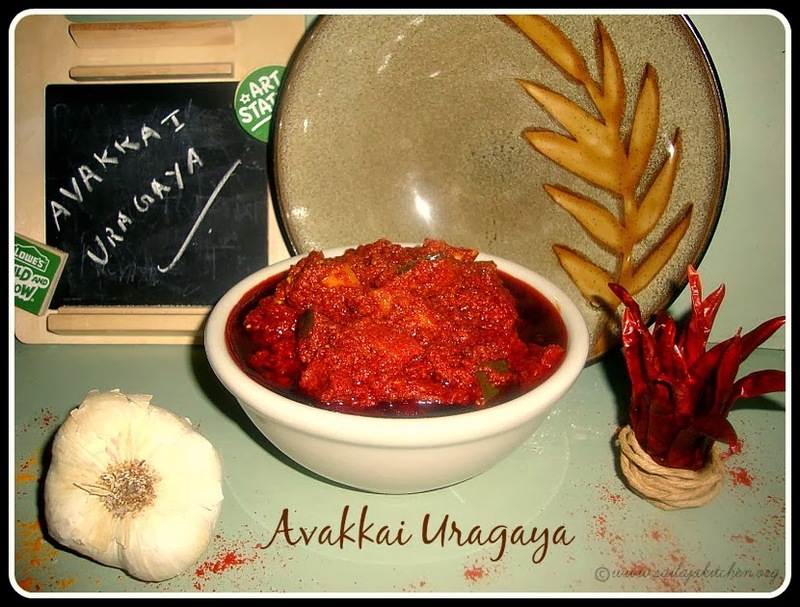 Cook the tomatoes,turmeric powder,jeera,tamarind & garlic till dry.Cool & make a smooth paste along with the salt & chilly sauce(do not add water while grinding).Keep it aside.Heat oil in a pan & temper it.Switch off the gas & add the ground paste.Mix it well,cool & bottle it.Store it in fridge. Toss all the above ingredients together.Put it in a clean jar & keep it in the fridge & serve it after 1 hour. Heat oil in a pan & temper it.Fry the grated mango till slightly cooked.Add all the dry powders except fenugreek powder.Fry a bit,switch off the gas & mix in the fenugreek powder & garlic.Cool completely & store it in fridge. Heat oil in a pan & temper it.Cool & mix all above ingredients together.Serve it the next day.Store it in fridge .